I have finally achieved my goal of reading every Stacey Lee book with The Secret of a Heart Note. While this book was definitely not what I expected, I found myself falling in love with the main character Mim. While I was pretty sure from the synopsis that I would end up liking Mim, what I didn’t expect was how much I would relate to her. Mim makes a lot of mistakes, and in true fashion, she makes a few more trying to fix her mistakes. The whole situation just seems to get away from her, steamrolling full speed down a hill, but in this way, it was incredibly relatable to me. Not to mention, the difficult relationship with Mim and her mother, as well as with her aunt, was incredibly fascinating and emotional. 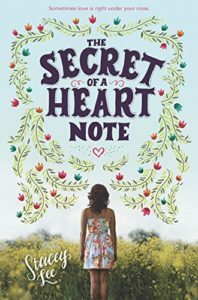 Even more so, The Secret of a Heart Note is about a character who sees a world she desperately wants, just outside her reach. It’s about a girl trying to save her friend from having her secret of being gay exposed to the high school. At the same time, it’s about the nature of love and their role as aromateurs. How much are they doing or interfering in love? And where does your agency lie? People in the town think that what they are doing borders on witchcraft, almost taking away people’s agencies, but without a true knowledge of the mistakes, the ways love can remain, and even Mim doesn’t know. The theme of family is one that was particularly emotional to me. Not only because sisters are my soft spot, but also because this relationship is about bridged distances that you can never seem to cross. It’s about the words once spoken that are hard to let go. And can we finally, after years, cross that gap? Because it can be that falling in love means you give up your family, your future, but this is about Mim’s journey to figuring out what these mean to her. Can she re-evalute her vision of the future, her family, and all the secrets buried in unsent letters from the past? Find The Secret of a Heart Note on Goodreads, Amazon, Indiebound & The Book Depository. What is an author who you have read (almost) all of their books?